What is the Irving PTO Fun Run? Help! I can’t find my pledge envelope! Help! I’m having trouble with the online registration system or I can’t find my login details. Where and when do we send donations? How far do the kids run? How close are we to the school goal? Can families come to cheer? This sounds awesome! Can I help out? Can my company match our donation? What are the pledges and donations used for? This was fun, but I have a question about something else. 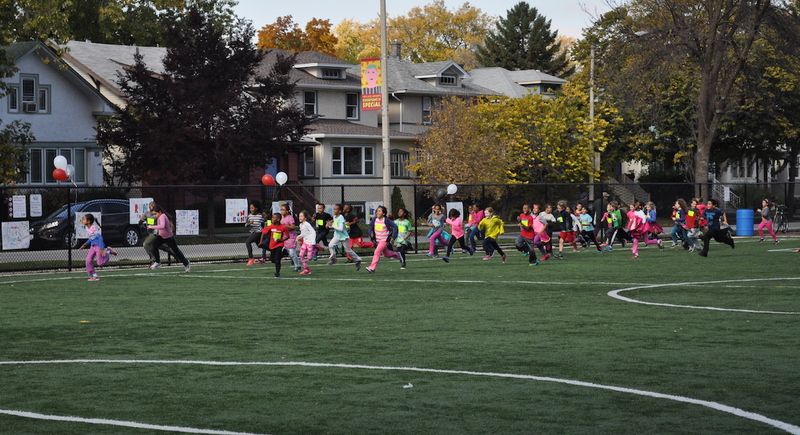 The Fun Run has become one of the PTO’s biggest fundraisers. It’s a healthy way to raise money for a wide variety of school activities. And it’s FUN! On Thursday, October 11, 2018 during the school day, students will run laps around the field. All students will participate in the Fun Run, regardless of whether they brought in pledges or donations. Online donations are a great way to get support from friends and family who live far away. However, the PTO keeps more money with cash and checks due to credit card processing fees. Checks are payable to “Irving School PTO.” Please make sure your child’s name is noted so the student and their classroom receive credit for funds raised. All Pledges are due by Friday, October 19, 2018! Don’t worry, you can use any plain envelope to return cash or checks. Make sure the envelope is marked with your child’s name and their teacher’s name. Email parent coordinators, Jessica Flannery, Dawn Goulet, or Melissa De Jesus Vasquez and they can try to sort it out. Note that you only have to register online if you’re accepting online donations. The registration email confirmation comes from noreply@eventsonline.us. Return envelopes to your child’s teacher once they’re done collecting pledges, or put them in the locked PTO mailbox in the front office. Online donations are processed automatically. Donations are due by Friday, October 19th. We don’t keep track of how many laps the kids run during the 30-minute run. It’s all for fun! Yes! Classes are competing against each other to bring in the most money and the most people who pledge (and have bragging rights). All students are given the starting goal of $25, but most choose a higher amount as their goal. Students who meet pledge goals of $25 and $50 will receive individual prizes. The top pledging student in each grade will receive an apparel item from the school spirit store. The top pledging student in grades K-2 and in grade 3-5 will each win a Garmin Vívofit® Jr. The class with the highest pledge total and the class with the most students participating will each earn a trophy and pizza party! All students in the school will receive a small prize for participation as a way of saying “thank you” for making it such a fun day. Click here to see the school progress thermometer and check the classroom leader board. Log in to your child’s personal website to track their own progress. Yes! Family and friends are welcome to come cheer on students during the Fun Run. Make signs, bring noisemakers or bring younger siblings to cheer on the kids. Sure! We need a few volunteers to help on the day of the Fun Run – Thursday, October 11th. We need volunteers to help set up before school, work the first shift from 8:30am-10:30am, second shift from 12:00pm-2:00pm, and clean-up after the Fun Run. There are also other miscellaneous tasks as well. Please email Melissa De Jesus-Vasquez or Dawn Goulet if you’re interested in helping in any capacity. It’s worth asking them. Checks are payable to “Irving School PTO.” The PTO is a 501(c)3 and donations are tax deductible in accordance with the law. A donation receipt letter can be provided upon request. Thank you for supporting Irving Elementary!